A new friend to the stuttering community has self-published her very first book. 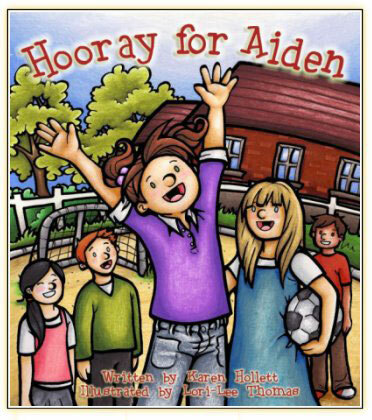 Karen Hollett has written Hooray For Aiden, a story book for children ages 4-9. It is a touching story of self-discovery as young Aiden moves to a new town and worries about how her second-grade classmates will react to her stuttering. At first, Aiden tries to hide her stutter from her classmates, which makes her sad. She has a caring teacher who helps her learn that it is OK to stutter and OK to be herself. Karen is a person who stutters herself and knows first hand how challenging it can be for a young person in school dealing with any kind of difference. Karen sought advice and guidance from members of the stuttering community to make sure the book would help children, and parents and everyone else, get the message that stuttering doesn’t have to hold you back. Hooray For Aiden has received positive reviews from professionals in the stuttering community and is sure to be a wonderful resource for kids who stutter. See some of the reviews here! I am looking forward to hearing more about Karen’s journey with her stuttering. She will join me on an upcoming episode of the podcast “Women Who Stutter: Our Stories” . She will, of course, tell her story. For more information about Karen and to buy the book, visit Hooray Publishing. Looks like Karen’s on to something. 3 Responses to "New Book – Hooray For Aiden"
This sounds like a good book for any difference. If you look at Karen’s website, her hope is that it will indeed help with any difference and will help parents, teachers, and SLPs understand the feelings a child who is different in any way. I think its great that a first time published author would go this route. I am excited to have her tell us her story. This book sounds really awesome! It’s so great that one of the messages is that it’s OK to stutter. I wish I had heard that a long time ago!